The County Clerk is the chief election official of the County, supervising all national, state, and local elections and is responsible for the administration of the Michigan Campaign Finance Reporting Act. 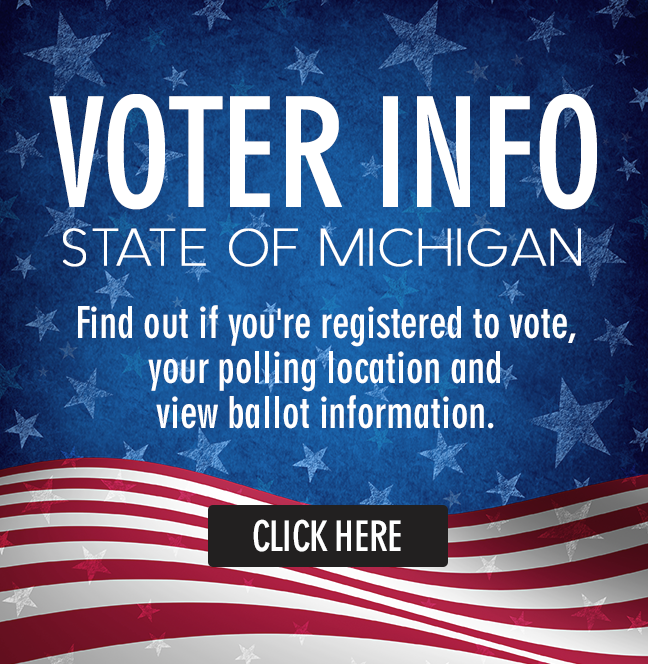 You can go to www.michigan.gov/sos to find out all the dates of elections, local, state, federal, and school. You can find many helpful topics on this website for election questions on forms, dates, procedures, etc. You can register to vote for federal, state and local elections by mail, by visiting your county, city, township or village clerk’s office or going to any Secretary of State branch. In addition, specified agencies providing services through the Family Independence Agency, Department of Community Health, Michigan Jobs Commission, and military recruitment centers offer voter registration services to their clients. You must register at least 30 days before the election. Whenever you move to a new location which is a different district than where you moved from you must re-register to vote. If you move within the same district you must update your address with your local clerk, at your polling place on election day, at a Secretary of State Office or by mail. A mail-in voter registration form can be obtained by contacting your county or local clerk's office. If you are temporarily outside the U.S., you may use a Federal Postcard Application (FPCA) form to register. FPCA forms are distributed through U.S. embassies and military bases. A Michigan resident who moves and registers out of state may not re-register to vote in Michigan until he or she reestablishes residency here. You may also register at the same time you renew your driver license by mail. Eligible drivers receive a voter registration application in the mail with their driver license renewal information. To vote, simply appear at your assigned polling place on election day. The polls are open from 7 a.m. until 8 p.m. If any of these situations exist, you can obtain an absentee voter ballot by writing your city or township clerk. You must state the reason why you need an absent voter ballot and you must sign the request. A pre-printed absent voter ballot application form is available from your city, township, or village clerk upon request. If you are temporarily outside the U.S. you can use the Federal Postcard Application to apply for an absent voter ballot. The FPCA must be signed under oath unless you, your spouse, or your parents are serving in the Armed Forces or Merchant Marines. Send the completed application to your city or township clerk for federal, state, city, township, or village elections. If you want the ballot mailed, your application must be received by 2pm the Saturday before the election. Make your request early to allow for delivery time. A voter eligible to vote by absent voter ballot may also vote in person at the clerk's office anytime up to 4pm the day before the election. All absent voter ballots must be received by the clerk's office not later than 8pm on Election Day. You may be eligible for an emergency absent voter ballot if a family death or illness requires you to leave your community on Election Day or you are unable to attend the polls because of personal illness or accident. The emergency must have occurred late enough that you could not file a regular absent voter ballot request. Have someone deliver your written request for an emergency absent voter ballot to the clerk's office before 4pm on Election Day. Emergency ballots must be returned by 8pm on Election Day. Federal and state laws require every city and township to provide accessible registration and voting locations for those that are handicapped. If a voter is blind, unable to read English or is otherwise unable to vote independently, he or she may bring a helper or ask the precinct board for assistance. A voter may not bring his/her employer or agent from his/her union or employer to provide voting assistance. A voter assistance terminal is also available in every precinct. Township Hall - 208 Front St. Township Hall - 132 N. Blackstone Ave. Township Hall - 31194 Fawn River Rd. Township Hall - Corner of Banker & Burgener Rd. Township Hall - Corner of M-216 & Creglow Rd. Township Hall - 30970 King Rd. Township Hall - Corner of Holtom & River Rd. Township Hall - 112 S. Clark St. Township Hall - 53640 Parkville Rd. Township Hall - Corner of Balk & Featherstone Rd. 64962 Balk Rd. The Board of Canvassers is comprised of two Democrats and two Republicans, appointed by the County Board of Commissioners, according to State law, to staggered four-year terms. Canvassers are responsible for certification of election returns for all national, state and local offices. The Board is also responsible for conducting recounts for all units of government in the County. The Board also inspects ballot boxes every 4 years. Administration is provided by the Office of the County Clerk. The Election Commission is comprised of the Chief Judge of the Probate Court, the County Treasurer and the County Clerk. The Commission is responsible for approval of ballot preparation for state and county elections, conducts the preliminary and accuracy tests of ballot tabulation computer programs used in elections, and passes on the clarity of language in petitions to recall elected officials. Administration support is provided by the Office of the County Clerk. Michigan regulates campaign practices largely through a law passed in 1976 – The Campaign Finance and Reporting Act. The basic approach of the act is one of allowing the public to observe the flow of dollars in and out of political committee treasuries. Different committees that may exist are Candidate, Ballot Question, Political Party, Independent and Political committees. Such committees must be established within 10 days after the person becomes a candidate as the law defines it and then they have 10 days to file the committee. The committee must have a treasurer but the candidate can be the treasurer of her/his own committee. This campaign finance information becomes available to the public and, more important, to the media and political opponents according to a prescribed schedule. Filing of pre-election reports are due 11 days before the election and must include the financial data up to the 16th day before the election. Post election reports close 20 days after the election and are due 30 days after the election. An annual statement closes on December 31 and is to be filed by January 31. Candidate Committees that did not receive or spend more than $1,000 need not disclose the detailed information but they must keep track of it even if they filed the reporting waiver. Failure to meet the report deadlines can result in a penalty of $25.00 per day to a maximum of $300.00. Other committees have similar fees. Campaign reports for state offices and judicial positions are filed with the secretary of state; all other candidate reports go to the county clerk. However, the act requires the secretary of state to make copies and send them to the clerks of the counties in which the various candidates live. Voter Precinct Maps are now located under the FORMS & DOCUMENTS section of the website. People who wish to become candidates for non-judicial offices in county government (county commissioners, clerk, sheriff, register of deeds, drain commissioner, prosecutor, treasurer, and surveyor) usually follow one of two procedures, although under certain conditions other means are also available. One method of getting on the ballot is to file nominating petitions that contain signatures of registered voters. The number of signatures required for nomination is based on population. An affidavit of identity must also be filed when the petitions are filed. People running for local officials at village, township, or city level will file their petitions and affidavit of identity with their local clerk. People running for county elected positions and the Judge of the Probate Court file their petitions and affidavit with the county clerk. People running for circuit and district court judge and state and federal positions representing St. Joseph County file their petitions and affidavit of identity with the Secretary of State in Lansing. Another common way of getting on the primary election ballot is by depositing $100.00 with the appropriate elections officer. For some offices, this is non-refundable.